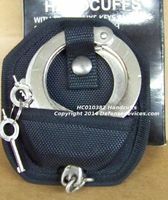 Nickel plated steel handcuffs connected with sturdy chain. 2 Keys included as well as ballistic nylon belt carrier. Very nice compact rig keeps your cuffs tidy on your belt. Good choice when you need cuffs that will not be recovered. Also, we have a nice set of chrome cuffs that are also double lock made in Taiwan. Also available with a a belt holster for an extra $2.00. See the drop down menu.